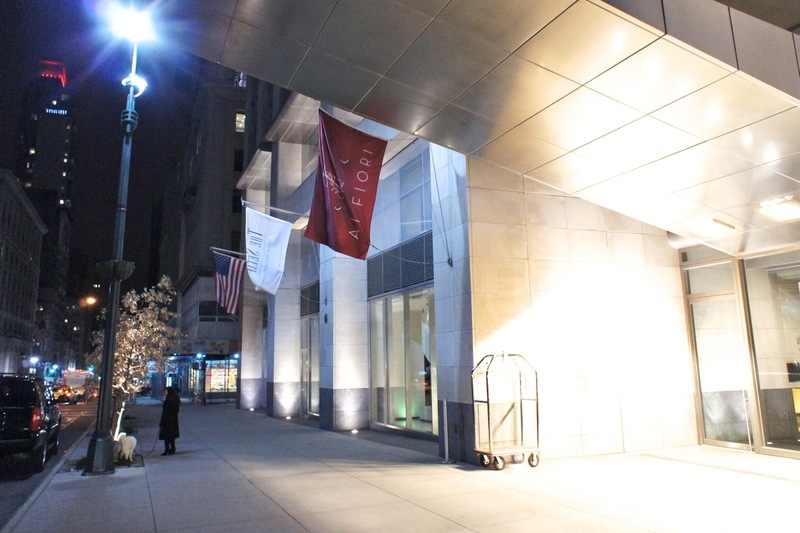 Along Manhattan's famous Fifth Avenue at the corner of 37th Street is one of New York's newer luxury hotels, the Setai, which was opened by the Capella Group just over a year ago. And shortly thereafter with no less fanfare, was the opening of Ai Fiori, New York celebrity chef Michael White's new restaurant. 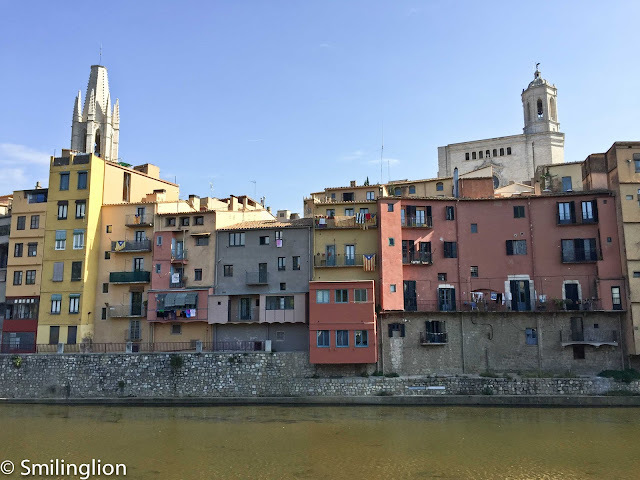 Despite it functioning as a hotel restaurant (being the only dining establishment in the hotel which necessitates it serving breakfast as well as lunch and dinner seven days a week), Ai Fiori was awarded one Michelin star in 2012. 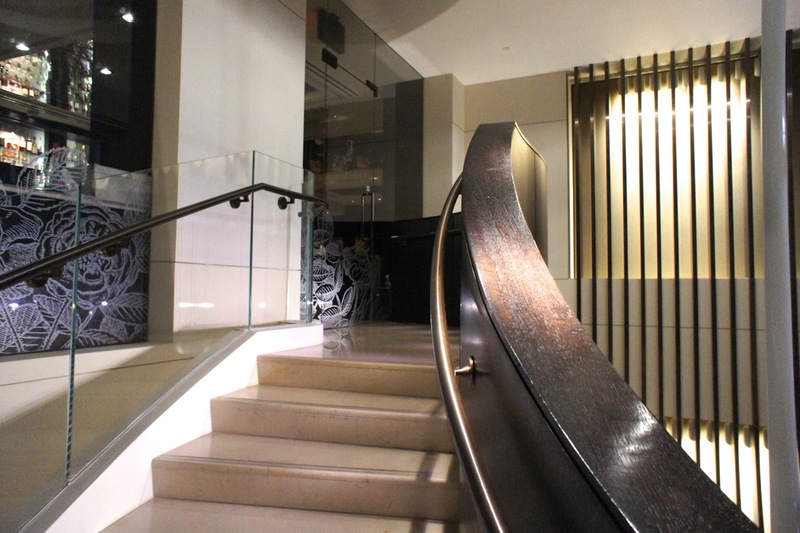 The restaurant is located on the second floor, up a spiral staircase just next to the hotel lobby. 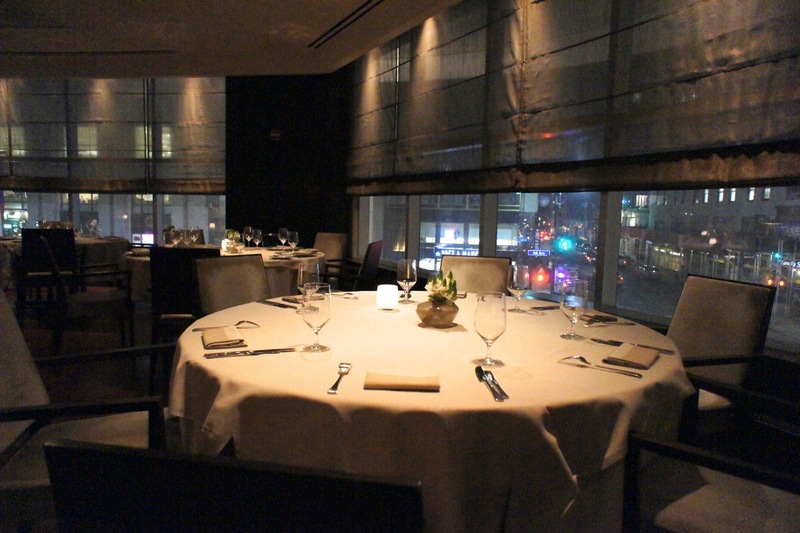 It has a large dining room, with a variety of table types (smaller tables for twos and large round tables for up to 6-8 persons), and the tables by the windows get a prime view of Fifth Avenue in all its bustling splendor. Ai Fiori specialises in Italian cuisine prepared in the French style, and the dishes described in the menu demonstrate the fusion between the two European cuisines. For this dinner, we ordered from the a la carte menu. The wine list though was very much Italy-centric, and there was a reasonable selection of good Italian wines. We picked out a Paolo Scarvino Bric del Fiasc, which was a favourite of ours, although this was a 2005 vintage and hence still tasted quite young. 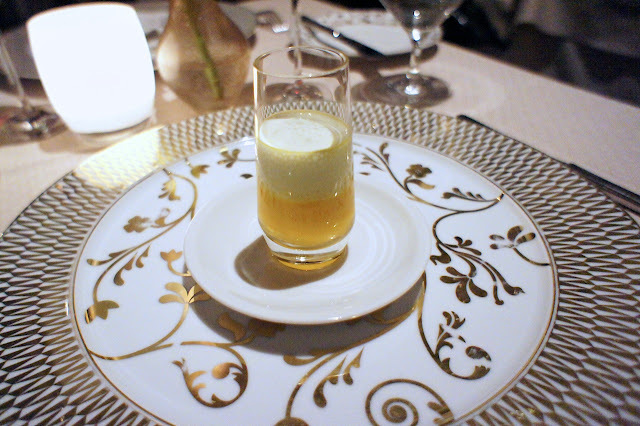 Amuse bouche of carrot and cumin soup topped with lime foam: The curry flavour of the cumin and the sweetness of the carrot in the soup interacted well with the acidity of the lime foam, to create a well balanced pre-dinner teaser which we quite enjoyed. 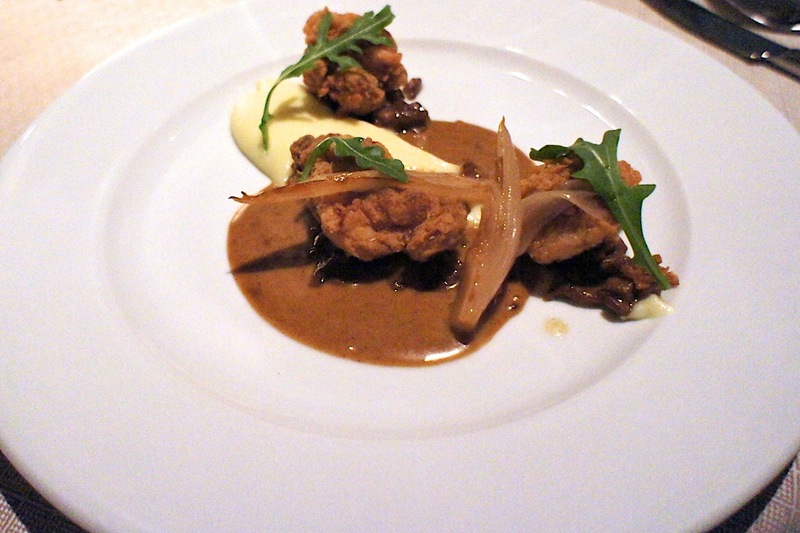 Animelle - crispy sweetbreads, pomme puree, truffle vinaigrette, pancetta: This was a very good starter. The sweetbreads were deliciously deep-fried and breaded, the sauce was rich and complex and the potato puree was smooth and luxuriant. 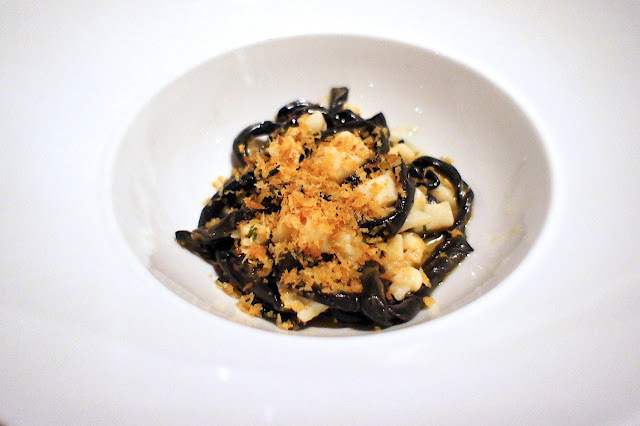 Trofie Nero - Ligurian crustacean ragu, seppia, scallops, spiced mollica: this was a traditional pasta of the Ligurian region of Italy, and was a short, slightly twisted and quite dense tubular pasta (which in this case was made with squid ink, hence the black color). The seafood ragu was made with squid and scallops (with small bits of both included) and the flaky bits (the spiced mollica) brought it a crispy texture and some spicyness. I thought this dish was quite good. 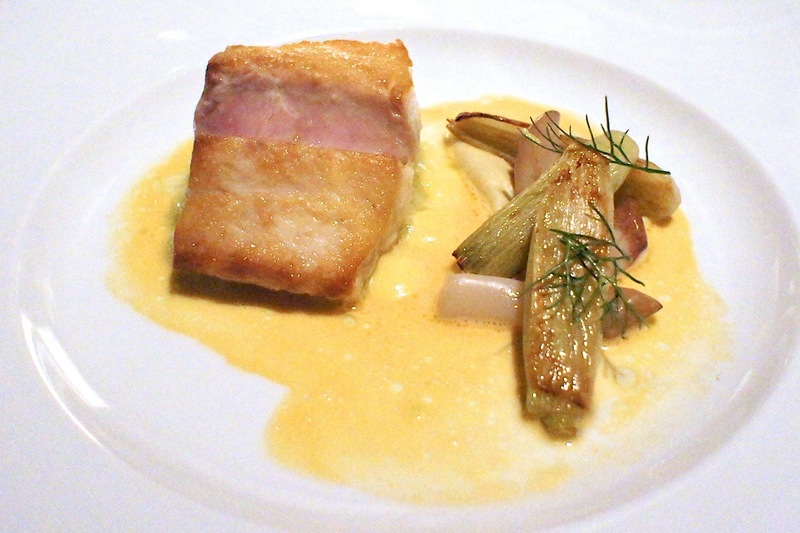 Spigola - olive oil poached wild striped bass, razor clams, ricci, fennel: I thought that the sea bass was slightly overcooked in this case, as the surface was dry and tough and on the inside, though still pink, didn't have the fresh and juicy flavour I'd expect from such a fish. Perhaps this was the result of the style of cooking (poaching in olive oil) and not any deficiency of cooking skill, but it wasn't as good as I would have expected it to be. The razor clams sauce was decent though. 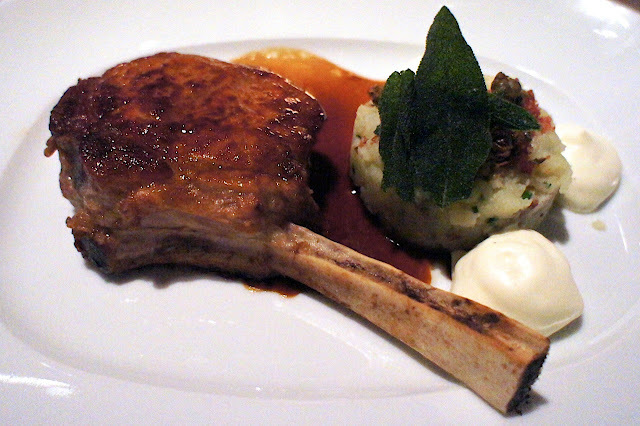 Vitello - amish veal chop "au four", saltimbocca, new potatoes: This was quite good, especially with the sauce, and it was quite a well-executed if otherwise unexciting main course. Baba al Rhum - tropical fruit, passion fruit coulis, crema di coco: We had read much about the rum baba dessert here and were very eager to try it. Unfortunately, it was greatly disappointing. The dessert came in two plates: one with the fruit salad and the other with the rum baba. 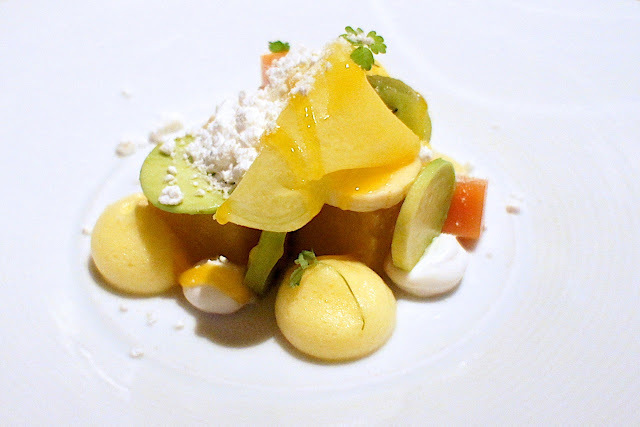 The fruit salad was refreshing enough, but could have been served separately as a pre-dessert (and if so would have been more appropriate). The rum baba was probably one of the worst rum babas we'd ever tasted. The pastry was hard and dry and it wasn't soaked in sufficient rum (such that we couldn't really taste the alcohol). 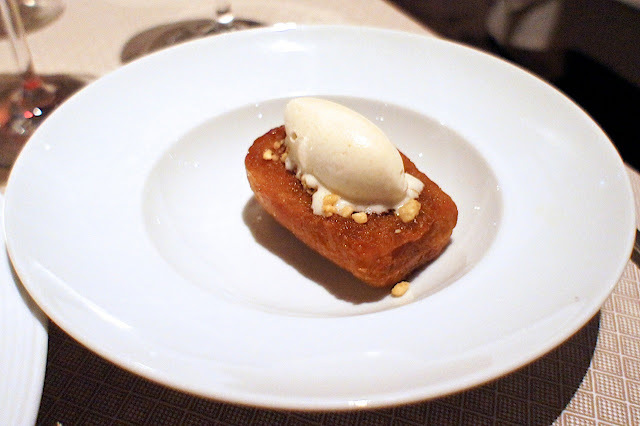 This was a far cry to the rum baba we had in Alain Ducasse at the Dorchester in London. 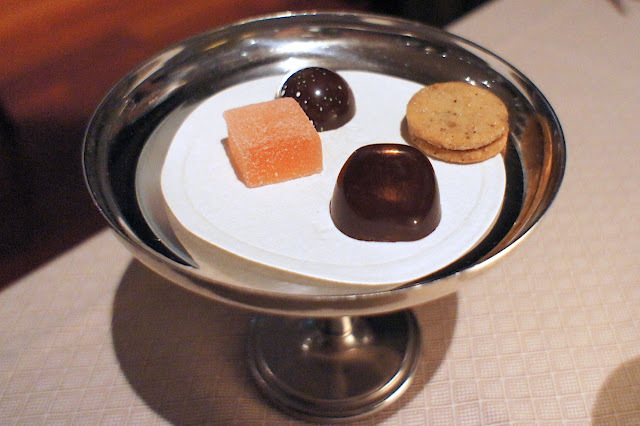 Petit four was a modest affair and we ended our dinner with some coffee and tea. Final Thoughts: We had come here with quite high expectations given the hype and some of the reviews we read online. The meal wasn't bad (except for the rum baba which was bad) but it wasn't great either. Service was very good, the dining room was comfortable and the wine list was decent, but the food neither impressed nor inspired us.